Tickets to the 2015 TEA Summit & Thea Awards are now available. Visit www.teaconnect.org for more information. Pat MacKay was founder of the publishing entity that produced TCI and Lighting Dimensions (now Live Design), and the LDI trade show. She immediately recognized and acted on mutual interests between her group and TEA, upon TEA's founding in 1991. Her activities included organizing workshops and events such as Themed Entertainment Weekends and Women in Technology meetings that helped focus attention on key issues and trends, and foster industry leadership. In the 1990s, she joined the Thea Awards Committee and served almost continuously through 2014. In 2012 she became a co-chair of the annual TEA Summit conference. Patricia MacKay will be the fourth annual recipient of the TEA Service Award, which was introduced to recognize outstanding contributors to the Themed Entertainment Association and its goals. Prior recipients of the award are Gene Jeffers (2012), Judith Rubin (2013) and Karen McGee (2014). The TEA Distinguished Service Award is presented annually by the Themed Entertainment Association (TEA) at the Thea Awards Gala, in recognition of a TEA member’s outstanding contributions “above and beyond the call of duty” to the Association.Nominations are open to the TEA membership; the final selection of the recipient is made by majority vote of the TEA Past Presidents Committee and approved by the TEA International Board of Directors. The TEA (Themed Entertainment Association) is an international nonprofit alliance founded in 1991 and based in Burbank, Calif. Some 1,000 TEA members represent roughly 8,000 creative specialists, from architects to designers, technical specialists to master planners, scenic fabricators to artists, and builders to feasibility analysts working in 30 US states and 32 different countries. TEA presents the annual Thea Awards and the TEA Summit and hosts the annual SATE Conference (Storytelling, Architecture, Technology, Experience). TEA also produces a variety of print and electronic publications, including the TEA/AECOM Theme Index, TEA Annual Directory and Thea Awards Program magazine. Visit www.teaconnect.org. 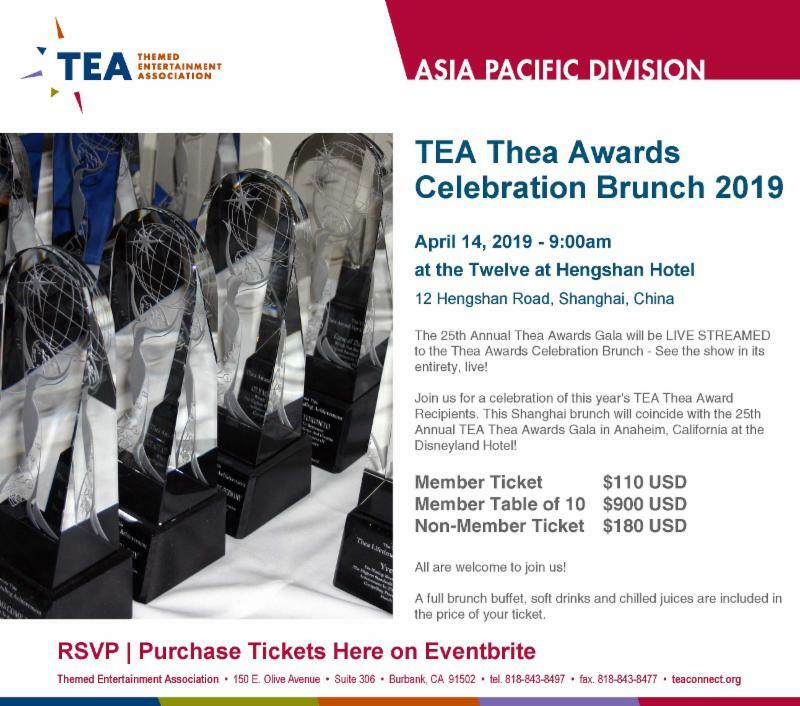 The Thea Awards, sponsored by Economics at AECOM, were created by the Themed Entertainment Association (TEA) to help realize a key mission of the association: bringing recognition to achievement, talent and personal excellence within the themed entertainment industry. 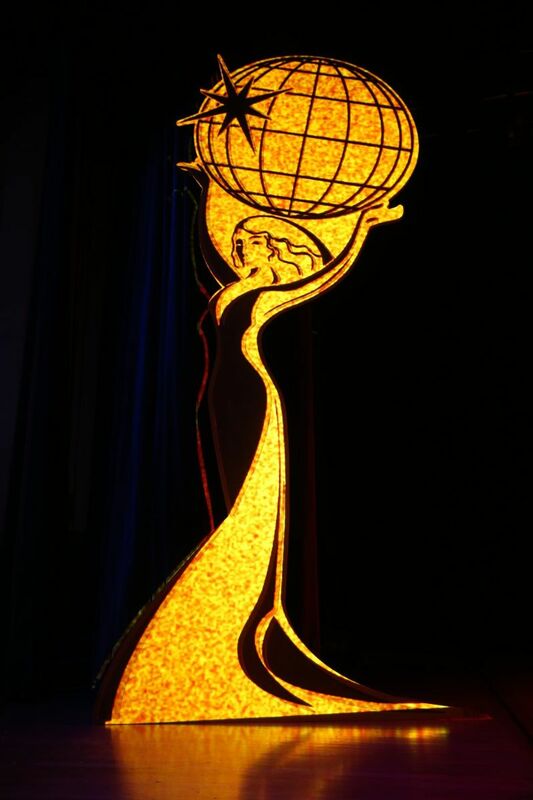 From a modest beginning in 1994, the Thea Awards have become internationally recognized as a symbol of excellence. The public is welcome to attend the black-tie 21st Annual Thea Awards Gala, which will be held March 21, 2015 at the Disneyland Hotel, Disneyland Resort, Anaheim Calif. USA. Tickets can be purchased at www.teaconnect.org. 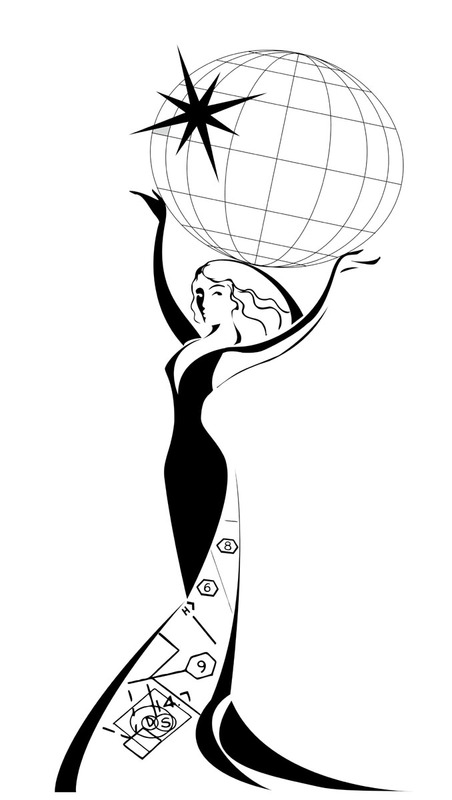 The name of the award is a play on three words: the first is "Thea," the Greek goddess from whom all light emanates. Thea was the mother of Helios (the sun), Eos (the dawn), and Selene (the moon). The second key word is "Theater," a word derived from the goddess Thea. The third word, of course, is TEA, for the Association. Patricia MacKay - a pioneering figure in entertainment communications - currently divides her time between her content consultancy Ones&ZerosMedia and her role as Editorial Director for Quite Specific Media Group. She is currently working with select experts to focus on digital development and content projects in theatre, film, themed entertainment, costume, sets, projection, and lighting under the banner of A Pat MacKay Project for veteran publishing company Quite Specific Media Group, Ltd. In 2014 her first project, Digital Costume Design and Rendering by Annie O. Cleveland was released and her second project, Peter Lawrence’s Production Stage Management for Broadway, just came off press in January 2015. In 2012, she produced back to back sessions for the annual USITT conference aimed at bringing themed entertainment professionals together with performing arts professionals to learn from each other. 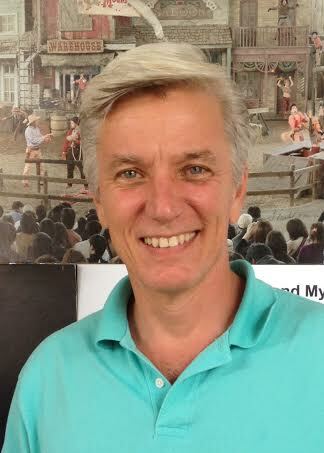 Journalist, writer, editor and publisher, MacKay founded Entertainment Technology Communications Corporation which published Theatre Crafts International/TCI and Lighting Dimensions (now published as Live Design), and founded the entertainment technology industry trade show and seminar event, LDI. She led the industry in creating manufacturer and product directories, summer theatre, university and college, and jobs guidebooks, the LDI awards and the TCI Awards (now the Live Design Awards) programs. A digital pioneer, she led the 1992/93 development of the industry’s first comprehensive, internet-based portal, ETEC. She pioneered coverage of the coverage of the world of themed entertainment with her special issues:Las Vegas Spectacular (1976), Theme Parks (1977), behind the scenes at EPCOT (1992), Las Vegas update (1994), and Cruise Ship Showrooms (1995). Since 1996, Pat MacKay has divided her time between writing, content creation, website development, and production for a wide range of new and old media, themed attraction, entertainment and special events projects for clients that include Times Mirror Group, Fox TV Studios, Warner Bros./Six Flags, Paramount Parks/Viacom, On Track Themes, Landmark Entertainment, Universal Studios, C2C, The Hettema Group, and Quite Specific Media. Selected projects include: Asian Games 2006 Opening Ceremony feasibility, Barcelona 2004 Opening Ceremonies, We the People, Halloween in Hollywood, and NYC 2012 for Spectak Inc., plus Hollywood Bar and Grill, Graumann’s Chinese Theatre tour, The Mask in 3D, Hershey’s Really Big 3D Chocolate Show, Hershey’s Factory Tour as well as a numerous location-based projects for China, Korea, Malaysia, Saudi Arabia, Abu Dhabi, and Dubai. She has edited, co-authored, and/or provided editorial direction for a wide range of works including: Walt Disney Concert Hall: The Backstage Story, To Boldly Go (Behind the Scenes at Star Trek: The Experience), The Art of the Abraham Lincoln Presidential Library (for BRC Imagination Arts), numerous articles on all aspects of entertainment and entertainment technology appearing in various websites, Theatre Crafts magazine, TCI magazine, and Lighting Dimensions, Theatre, Spaces, and Environments (for Schechner/Rojo/MacNamara)/Drama Book), The Shakespeare Complex (with Glenn Loney/Drama Book), Supermannerism (for C.Ray Smith), and The Shapes of Our Theatres (for Jo Mielziner/Clarkson Potter). MacKay has served as producer and moderator of panels and workshops on entertainment architecture, theatre architecture and themed entertainment and location based entertainment design. Additionally, she was instrumental in the launch and structure of eight years of Lighting Dimensions International workshops and seminars, She has also participated in sessions at Indiana University, Pro Sound and Light Asia/Singapore, World Light Fair /Tokyo, USITT, and the TCI Weekend Workshops. She was elected fellow of the USITT in 1984, co-chaired the USA’s golden-Trigue-winning Prague Quadrennial Committee, is the winner of both the New England Theatre Award and the USITT Health & Safety award, and since 1996 has been a member of the Themed Entertainment Association's Thea Awards Committee. She has served on the Wally Foundation Board of Directors and is active on the USITT Fellows Make It So task force. In 2007, she was honored with LDI’s Light In Life award for her many achievements and innovations. In 2012 Pat MacKay joined Roberta Perry as co-producer of the annual TEA Summit.